The beginnings of the Englewood Fire Department cannot be discussed without first mentioning “The Protection Society of Hackensack Township,” which was organized during the Years immediately following the Civil War. The man who originally came up with the idea of this organization was James W. McCulloh, a longtime resident, then living in Teaneck. The purpose of this organization was “the maintenance of order and the protection of property,” which may have been looked upon as an early police department rather than any type of fire department. The society was incorporated on February 6th, 1869, with the first membership of thirty-one members including the greater part of the able bodied male residents of Englewood. The first five years of the society were the most difficult, the active members being always subject to call for service other than apprehending thieves, for Englewood had no fire department. Moving ahead, during the summer of 1886, the Hackensack Water Company completed the laying of the large mains in Englewood and supplied the township with an abundance of pure water, drawn from the upper sources of the Hackensack and filtered at the reservoir and pumping station at New Milford. A committee of citizens, appointed at a taxpayer’s meeting, presented a petition to the township committee that the authorities rent forty fire hydrants from the Water Company and have the same placed in proper locations. The petition was granted and a contract was made with the company for three years for the number specified in the petition at $15 each per year. A preliminary meeting to organize a hose company was called on October 10th, 1887, by a number of citizens, among them Donald Mackay ( Mayor 1906-1909), Dr. H.M. Banks, John E. Miller, Joseph H Tillotson, Jacob Taylor and George Dutton. An application was drawn up, asking the township committee to call a special meeting to vote an appropriation of not more than $2,000, to establish and equip a hose company. The meeting was held and the proposition carried at the November election. The company organization was completed and an application for incorporation was filed on November 1st. Ten days later, the township committee met a committee from the hose company and granted the firemen permission to spend $1,000 of the appropriation for hose, provided the sums were advanced by some citizen, in anticipation of taxes. Mr. Brinckerhoff advanced the money and the township committee ordered the hose, to be delivered within a few days. But in the early morning of November 22d, a township night watchman discovered fire in a room over Magnes confectionery store, in the Athenaeum. There were hydrants and water but no hose. All those no, who floked to the scene did, was to remove what they could from Springer’s hardware store and Mrs. Chamberlain’s dry goods establishment. The mails were saved from the post office in the southeast comer of the building, but the records were lost. Adjacent buildings were saved by a bucket brigade, which poured water on their roofs. Donald Mackay, as a former Brooklyn volunteer fireman, directed the efforts of the workers. The boys of Smith’s school, also occupants of the Athenaeum, had a holiday when assembly time came around, for nothing was left of the building where the school was located, except the outside walls. The Atenaeum, located on the northwest corner of Palisade avenue & Engle streets, was a brick structure, three stories high, with a mansard roof which converted attic space into a sort of additional story. It was a big building. Seventy-five feet square, something tremendous for the time and place. There were stores on the ground floor on the avenue side, and the upper stories were laid out as offices fronting on Palisade Avenue. The entrance lobby, on the Engle street side was insignificant in dimension, the stairway leading to the auditorium on the rear of the second floor leaving much to be desired in points of safety and convenience. With a hall that had a seating capacity of 800, The Athenaeum opened in the early part of 1870 with a grand concert. By the year 1889, Englewood had now some measure of protection in the fire company, with Jacob Taylor, foreman, and Charles C. Townsend, assistant foreman. Foreman and assistant foreman were titles from this era and would most likely be equated with chief and deputy chief, which is more common and familiar these days. Moreover, the Englewood Fire Association had a firehouse on Van Brunt Street, with a tower and a bell. Inside the house were a hose cart and a fire truck, both horse drawn. When a fire broke out, horses were quickly brought from the foreman’s livery stable, near at hand. The company was a lively one, with plenty of esprit de corps, and got under way in short order. There were times, however, when the best of will to do and the strongest muscles were hindered by the peculiar physical conditions to which Englewood was subject. With an icy hill to negotiate on a winter night, the company found promptness virtually impossible, no matter how the horses were lashed. In 1896, the city council held it’s first meeting on May 4th. The Protection Society, which had given such aid in Englewood’s youthful days, held its 28th annual meeting on May 2nd. The consensus of opinion of the directors and members present was that change in the form of Englewood’s government did not necessitate doing away with the society, and a vote prevailed for continuance and cooperation with the city authorities. The change of the form of Englewood’s government being referred to, is the township’s move to become incorporated as a city. The active days of the society, however, were practically over, though the form of organization was maintained for several years. It was at this organization meeting of the council that Mayor Currie presented his first message, reviewing the status of the city as to finance, health and fire protection. He recommended the election of a fire chief and the establishment of a fire alarm system. Jacob Taylor was reelected foreman of the fire company. During the year of 1897, the Gamewell fire-alarm system was ordered installed. This system remained in service for nearly one hundred years, ultimately being removed from service in the 1990’s. Also, in the latter part of 1897, the council noted that when fires occurred on the hill the speed of the hook and ladder truck was lessened by the number of men riding upgrade. A new rule set a limit of two men, and the chief was authorized to send the rest “by express” through the hiring of an express wagon. In the spring of 1900, a bonding ordinance was passed by the city council in favor of a proposed firehouse. Ground was broken on May 19th, the building being that on Palisade avenue ( No. 46 W. ), which would become the central lire station of the city. When the plans for the building were under consideration, Elbert A Brinckerhoff who was elected mayor in 1899, objected to what he deemed the structural weakness shown. The council gave no heed to his protests but went ahead with the work. Later on, when the opening of the firehouse was being celebrated by a parade, with visiting fire companies and a collation on the premises, the mayor had the last laugh on the council. As head of the police department, he placed an officer at the foot of the stairs and no one was permitted to inspect the upper floor, the mayor deeming it unsafe for a crowd. As events proved, the mayor was entirely right, the building having to be strengthened within three years, under the second Currie administration. Early in 1902, an ordinance was drawn for $15,000 to build firehouses at the Nordhoff and Highwood sections of the city ($4,500 each), and to strengthen firehouse number one, on Palisade Avenue. In July, the plans and specifications of Davis and Shepard for firehouses at Nordhoff and Highwood were accepted by the council. Charles J. Stagg was the successful bidder and received the contract for erecting the houses. In the spring, the city had purchased four fire horses for $850. The biggest of the lot was named Dan, ambiguously, for the mayor or president of the council. These were the first fire horses owned by the city. On January 1st, 1903, the resolution was unanimously carried for the appointment of an inspector of the fire department at a salary of $100 a year. In February, fire company four, on the hill, organized with St. George Barber as president, Theodore Childs as vice-president, Reginald Halliday as secretary and Malcolm Mackay as treasurer. William Baldwin was chosen foreman and Stuart Eakin assistant foreman. The company had twenty members and, in April, celebrated the installation of a hose reel on the property of E.P. Coe, east of Woodland Street and north of Palisade Avenue, by having a grand parade with open-air speaking and a collation. The Nordhoff Company, with Peter Spindler at its head, and Highwood, with Thomas Curry in the forefront, joined the parade. Fire Chief Jacob Ullrich and three councilmen were in attendance as well. Another parade occurred in June, when the new firehouse at Highwood (number 2) was formally opened. The control of the fire department was a matter considered and settled by the council in 1906. The volunteer force had hitherto elected its own officers, much as club officers would have been elected, on the ground of popularity. The members of the department were “exempt firemen,” in that they are exempted from taxation on an assessed valuation of $500. About this time state courts held that this exemption was unconstitutional. To offset the decision, Englewood took the course of many other municipalities, turning the force into a paid force at a salary of twelve dollars a year, approximately equal to the amount previously exempted. The salary was paid those having an attendance percentage of fifty or better. The council felt that a “paid” force should be more subject to supervision and put through an ordinance that caused uproar among the firemen, providing that the chief officer of the department and assistant foreman should be appointed by the council. The fire associations could make their own rules, but these must be approved by the council. The number of members was limited, number I to thirty and the other companies to fifteen each. No men were to be dropped, but no new members could join in excess of these quotas. Much to be regretted was the passing of fire chief Jacob Ullrich, on October 3rd, from illness contracted in the line of duty. Chief Ullrich was born in Germany on February 9th, 1858, coming to this country at an early age. He entered the first fire department on August 18th, 1888, and was elected foreman of Company I in May 1897. The next year he was elected fire chief and was re-elected each year until 1907, when the office was filled by the appointment of the council. Then Chief Ullrich was continued in his position by appointment. Emil Ruch became acting chief upon Chief Ullrich’s death. In June of 1911, a La France automobile fire engine was bought for $7,500. 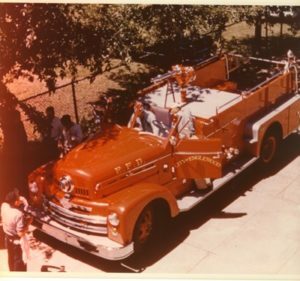 Shortly there-after, fourth ward councilman William Conklin suggested that a paid fire department of four or five men be created, so that adequate use might be made of the engine. No action was taken on this until 1912. The destruction of the Bergen building, on the corner of Engle and Bergen streets, by fire, occurred on March 10th, 1911. There was a high wind and the water pressure was low. The fact that the telephone exchange, which was located in the building, was put out of commission immediately, disabled the firemen in summoning aid to prevent the spread of the fire. Protection Steam Engine came from Hackensack to assist, after word reached the company in a roundabout way. Ground was broken on August 24th, 1900, for the construction of the Bergen building. The building was erected by F.W. Phelps for the Bergen County Gas and Electric Company and was also occupied by the telephone company, the sewerage company and the Palisades Trust and Guaranty Company. The loss, as finally estimated, was about $40,000. New year of 1912 extended the greetings of the season to the new mayor, Vernon Munroe. At the organization meeting on New Year’s Day there was the usual attendance of officials departing, officials incoming, citizens generally, with an ex-mayor or two to welcome the new city head. The first act of the administration was the creation of a paid fire department, a plan carefully considered and thoughtfully worked out in detail. The ordinance provided for the organization of the paid department with a chief, lieutenant, drivers, and privates. A board of fire examiners was created to pass upon applicants for this department. Firemen’s salaries were fixed as follows: Chief, $1,020; lieutenant and drivers, $840; privates, $780. This movement created a great deal of hard feeling among the volunteer firemen. The mayor and council had acted for the best interests of the city and had expected the volunteers to continue as firemen, supplementary to the men who would be taken on as paid firemen. The men of the old fire department did not take well to the idea of a paid department. While the grumbling and dissatisfaction were still rife, the ordinance was passed. Emil Ruch was appointed chief, Thomas Markham, lieutenant, with six privates under them. Matters came at last to such a pass, the former firemen as a body refusing cooperation, that the volunteer force was abolished. A new volunteer company was started at firehouse number one, of those members still willing to serve. Later in the year the office of fire commissioner was created, Mr. Frost, who was a veteran of the New York City Fire Department, receiving the appointment at a salary of fifty dollars a month. In the spring of 1914, a volunteer company was organized at Highwood. In October of 1915, Lieutenant Thomas A. Markham became chief of department due the retirement of Chief Emil Ruch on half pay. In June of 1917, an ordinance was passed abolishing the office of fire commissioner, creating in its place a board of three commissioners. The change made Chief Markham the executive head of the fire department.